Erissery is one of the traditional dishes of Kerala. 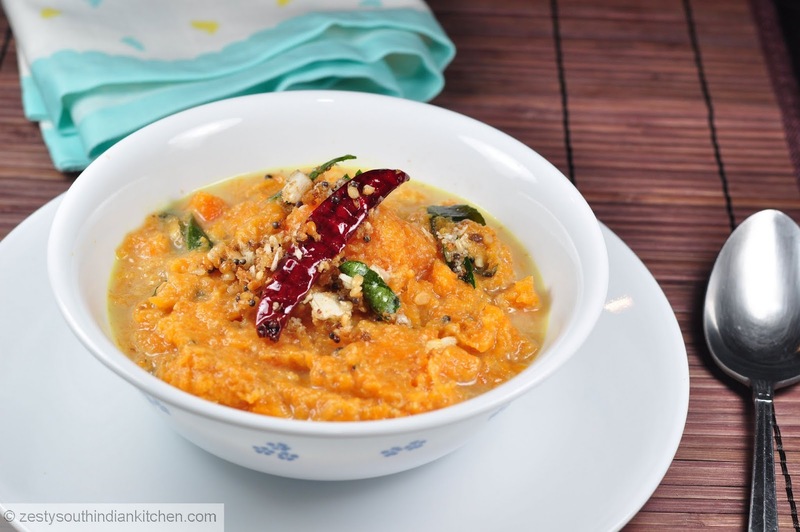 It is usually made with Chena (Yam), Vazhakkaya (raw plantain), pumpkin etc. If snake gourd (padavalanga) is used then moong dal (spilt green gram) or toor dal (pigeon peas) are also used along with it. Amma usually made pumpkin erissery and snake gourd erissery. As usual every home has their own version of erissery with minor variations. I used to make erissery with pumpkin variety named as Cuban squash/ calabaza. I get them from grocery stores like HEB or Fiesta. They are rich in vitamin C and calcium read more about them from here . Whenever I find them, I will pick them. I made a soup one time, it taste great but it caused bloating of stomach, after that making soup is out of question. My hubby doesn’t like pumpkin in other curries especially in sambar. My little one likes it if it is less spicy, she will takes some bites. She finds more tasty food in mom’s plate than priced Geber baby foods. If you ask me will you make any other dish with pumpkin I will say olan. Erissery is my favorite. Cooked pumpkin in spicy coconut sauce with seasoning of mustard, urad dal, fried coconut and curry leaves gives a wonderful aroma. Merger between sweetness of pumpkin and coconut with spicy green chilies takes your taste buds to another level. Try some time and you going to like it I am sure. I didn’t use curry leaves as I am out of them. If you have in hand feel free to use them. Here goes the recipe. Peel the skin of pumpkin and wash and cut into small cubes. In a sauce pot cook cut pumpkin along with turmeric powder, salt and one cut green chilies with 3 cup of water until it well done or 20 minutes. In the mean time grind 1/ 2 cup coconut with remaining green chili,ginger,cumin seeds and ¼ cup water to form a smooth paste. 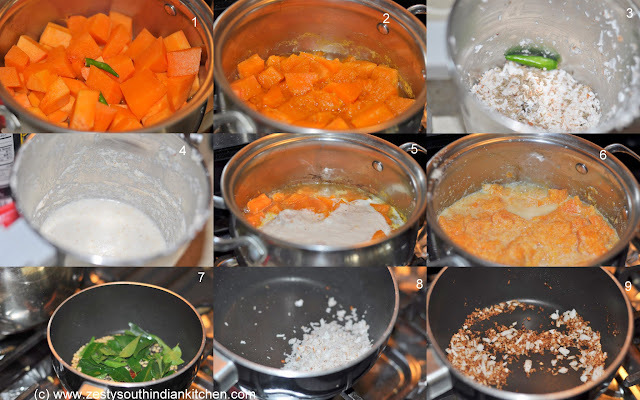 Add this ground coconut paste into the cooked pumpkin and check salt if need add some more. In small pan heat oil and add mustard seeds, urad dal and halved red chilies on mustard seeds starts spluttering add 3 tablespoon of coconut and fry them until it become slightly brown. Remove from the heat and pour into the pumpkin coconut mixture and switch off the flame. Pumpkin in coconut gravy looks very colorful and delicious. hi. This is one of the simplest and tastiest preparation, looks good. Love the taste of sweet and spicy Butternut squash, Erissery looks yummy. A friend of mine asked me this recipe over phone today..And just told her how to make it…my recipe is almost the same but I use kunjulli too..Looks delicious..this is my fav erisserry. Lovely curry. I actually mix this with rice and eat it. What a lovely recipe ,never cooked pumpkin with coconut before.I am going to try it. 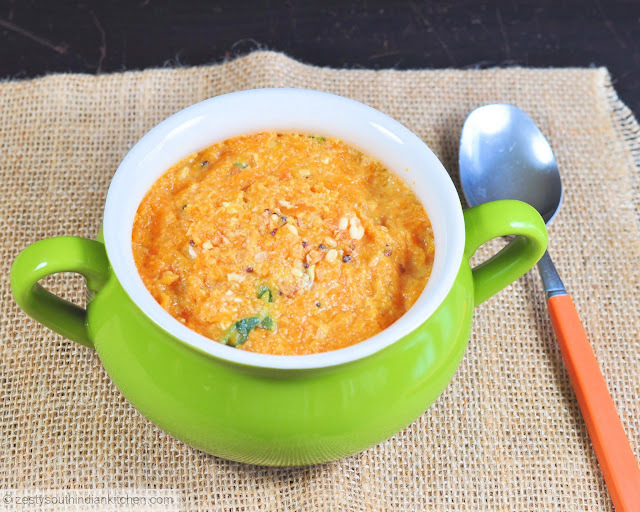 Love this recipe and I always love pumpkin. Yummy!!!! If you have more summer food ideas consider entering our sizzling summer contest, you could one of tow $50 prizes. pumpkin in coconut gravy looks so yumm. looks very inviting..
swathi, erissery looks too good.My mom makes them wonderfully. Urs pictures is making me drool. Droolworthy erissery, am yet to try erissery at home…tempting dish..
Looks great. I have no patience to fry coconut and pour over etc but I know how great it tastes. Nice recipe. Swathi,,nice yellow pumpkin curry dear you hv done it perfectly dear..my amma also cook this yellow pumpkin curry for festive times dear.. This is a very different combination. I love coconut, and I’ll have to give this a try! Swathi, a nice way to use pumpkin. Sorry, I am bit bc and only today I am looking at all your other posts. We call that rice vermicilli as sevai. You can also prepare coconut, tamarind or lemon sevai. Hey looking spicy and yummy one….tempting color of the dish is really superb…. Oh the pumpkin looks so scrumptious! You have brought fall with this dish. Nice dish with coconut sauce.